Serve this delicious old-fashioned meatloaf with mashed potatoes and green beans or corn, or serve it with your favorite vegetables. If your beef is quite lean, add some ground pork to the meat mixture to keep it moist. Leftover meatloaf can be used in sandwiches or sliders. Or freeze it in individual portions for lunches. Grease an 8 1/2-by-4 1/2-inch loaf pan or line it with foil and lightly grease it. Alternatively, for a free-form loaf, line a rimmed baking pan with foil. In a large bowl, combine the ground beef with the crushed saltines, onion, green pepper, egg, paprika, garlic powder, salt, thyme, black pepper, 1/3 cup of ketchup, milk, and Worcestershire sauce. Pack the meat mixture into the loaf pan or shape it and place it on the baking pan. Bake the meatloaf for 1 hour. Carefully pour excess grease into a can or jar (dispose of it in the trash after it cools). 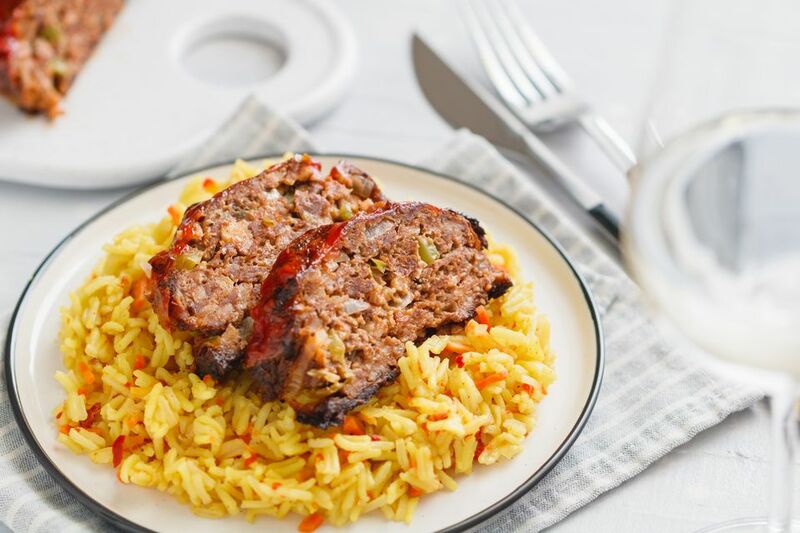 Spread the meatloaf with 1/2 to 3/4 cup of ketchup or barbecue sauce and continue baking for 15 minutes longer, or until the meatloaf registers at least 160 F on an instant-read food thermometer inserted into the center. If there is any ground poultry in the loaf, cook it to 165 F.
Meatloaf can be tough if overmixed, so mix it lightly with your hands or spoon. If you want to make sure the seasoning is to your taste, take a small amount and fry it. Taste and adjust the seasonings in the raw mixture. Your meatloaf will hold together better if you let it rest for 10 minutes before slicing.